Some clever griefers try to circumvent PvP safe zones (and no-PvP worlds) using fire and lava. If your world is no-PvP, GriefPrevention will prevent players from placing lava or fire very close to others. They also like to spawn camp on PvP servers, often waiting right at the spawn, just outside of a protected area, or outside a victim's house. 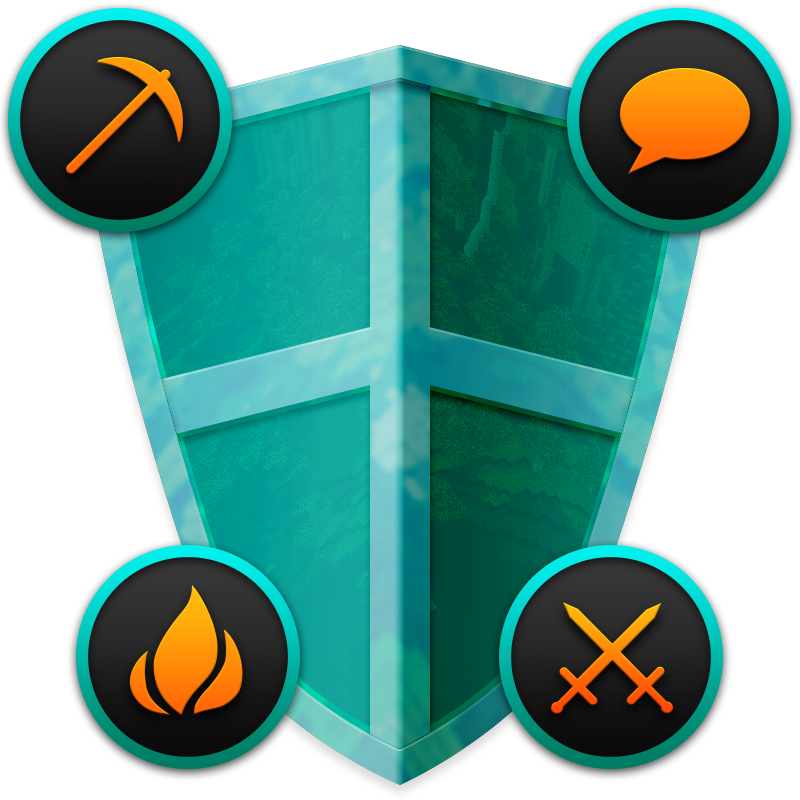 GP's anti spawn camp protection simply protects players from PvP as long as their inventory is empty, and prevents them from accidentally picking-up any items dropped on their spawn point, effectively answering all of those camping strategies without requiring you to designate PvP-free safe zones (which griefers exploit to avoid being killed themselves). Players are not immune to PvP on their land, but because other players can't use their buttons/switches, a player can create a safe home by designing access mechanisms into it (iron doors with buttons, for example). While the player is at home ONLY, other players may /Siege him, destroying ONLY soft blocks like dirt, sand, gravel, glass, and cobblestone (these materials are configurable). Thus by using quality materials or designing very carefully with a mix of hard and soft materials, any home can be made defensible. While a player is logged out or away from home, attacking his home would be really only griefing (his gear isn't up for grabs, and there's no one there to make it a fair fight), so siege is disabled in those cases. While under siege, containers in besieged claims will be disabled, and no one can build there, a small penalty for refusing to fight (and preventing players from stuffing all their valuables into boxes before going out to fight, or building themselves into a safe room). Besieged players are also unable to toss items on the ground for later retrieval, or log out. So a player under siege must either wait it out, fight and risk losing items and experience, or try to escape. Note that there's nothing stopping a defender from receiving items from someone else (think supply lines). Similarly, anyone may join in on the attacking side without even using the /siege command. The siege ends when the attacker gives up and leaves the area (defender wins), the defender escapes (attacker wins), or one of the two dies or logs out. The defender hasn't "escaped" until he's both in an unprotected area and a reasonable distance away from the attacker. If a defender runs to another claim where he's protected, the siege will extend to include that claim as well. When a defending player loses, his doors (but not chests) unlock so that the victors can collect the loser's drops. After a short time, any players who don't have access to the claim will be ejected to discourage in-home camping. The attacker can't siege that defender or his claim again for an hour. This may seem like the attacker has the advantage, but a well-prepared defender can prepare not only an impenetrable build, but integrate useful strategic elements like drawbridges, arrow slits, one-way doors, secret escape routes, and lava pipelines. Further, the attacker is vulnerable to surprise attack by the defender's allies, because in most cases the attacker will be out in the open. Thus, build design (the core strength of Minecraft as a game experience) and PvP are related in an interesting way that adds depth to the experience, while build/break griefers come to an almost full stop. Sieges involving break-ins through weak walls, through windows and skylights, and digging under strong walls. Attackers constructing scaffolds and stairs, or tunnels, from outside a claim's boundaries to access rooftops and inner rooms with weak floors. "Lifelike" sieges where both parties are just waiting it out, to see who runs out of patience first (battle of the wills!). Players building cunning defenses into their builds, like one-way doors, stone trenches, pitfalls, disappearing bridges, lava pipelines, clever arrow slits, and secret escape routes.